Everyone should have the opportunity to experience the Wonder of the World -- the inspirational power of our planet's greatest cultural masterpieces and sites of natural beauty. That is why a portion of the proceeds from every Wonder of the World journey and seminar goes directly to our Janet Dunne Memorial Scholarship Fund. These merit-based scholarships will allow deserving individuals who might not otherwise have the financial resources to participate in our endeavors to join us for a life-changing experience at no cost to them. When you choose The Wonder of the World, know that you are doing something wonder-ful for yourself, for others, and for the planet. Share the Wonder -- please donate below. 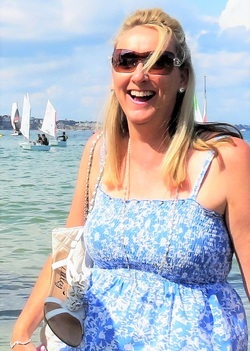 Janet in St.Malo, France, 2014. The Wonder of the World is honored to commemorate the life of a dear friend, Janet Dunne (1971-2015), by inaugurating the Janet Dunne Memorial Scholarship Fund. A native of Wigan, in Northern England, Janet lived much of her adult life on Jersey, in the Channel Islands. Funny, gregarious, and ebullient, Janet struck me as someone impossible not to love. Janet knew well how to enjoy life: she loved taking runs along Jersey’s gorgeous coasts, and indulging in a great book, a glass of wine, a bubble bath, and a good laugh. A gifted musician, Janet played violin in the Jersey Symphony Orchestra; she also expressed her artistry in calligraphy and with her keen eye for design. Janet loved the French language and all things French; she was an active participant in the Alliance Francaise, including their contest in French elocution, and her dream was to open her own bed and breakfast in France one day. ​Above all, Janet was the truest of friends, whose unfailing support, compassion, and generosity earned her a legion of friends and admirers who adored her, and who, like me, were heartbroken by her loss at age 44 of cancer. Janet’s life serves as an ideal ambassador for The Wonder of the World and everything it represents. She understood and encouraged my vision for the organization in the early days, not only because she was a loyal friend, but because she herself was filled with wonder. I can think of no one who would have appreciated the opportunity to travel more and to learn more than she, but financial restrictions made this difficult for her during her lifetime, as they do for so many others. Janet was never embittered by that reality, and until her last day inspired me and all those around her with her courage, unselfishness, and positivity. With her largess of heart and spirit, Janet truly made the world a better place by being in it. The Wonder of the World seeks to carry on that legacy with the scholarship fund that bears Janet's name, by providing other talented, curious, and passionate people the life-changing opportunity to explore the world. ​On behalf of my dear friend Janet, I thank you for your support.